Team IMPACT is a national nonprofit that provides an extended support network to children living with serious and chronic illnesses by matching them up with a local college athletic team. We believe that our program can help a child increase their confidence, optimism and sense of belonging through these relationships. Children feel like they are members of the team, contributing in ways only they can, to provide insight and inspiration to the student-athletes that cannot be found on the field or in the classroom. Driven, organized and responsible students sought to join the Team IMPACT Internship Program. College Commitment: FALL or SPRING Semester(s); SUMMER: 8-10 weeks. June & July. Typically, 2-4 days/week. Intern candidates should prepare for an enjoyable and transformative experience while at Team IMPACT – one that allows candidates to participate in, and contribute to, real nonprofit work at a rapidly growing nonprofit with a fun and driven staff. 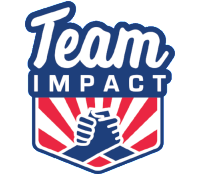 In 2019, Interns will be selected by, and concentrate work within, specific departments at Team IMPACT. Opportunities will be provided in: Program(s), Finance & Operations, Development, and Marketing & Communications. Each candidate should select which desired areas of concentration at the time of application. 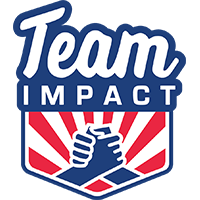 Interns at Team IMPACT will be challenged to think creatively and collaboratively, work with a passion, and show strong attention to detail and diligence. In this competitive program expectations include taking a lead on a diverse range of projects, working with & without supervision, and contributing to our organization’s culture and our mission’s success. Independently, and as a group, interns will be exposed to opportunities that include shadowing Senior Leadership and Case Managers, attending scheduled events and sitting in on strategy meetings. Our goal is to make sure our aspiring professionals make substantive steps forward in their career development across the many facets of Team IMPACT. With so many ways to contribute to our mission, participants can make lasting contributions while gaining valuable and targeted professional experiences and skills. That’s what we call a “win-win”. Please email resume and cover letter, outlining your skills and experience, which area of concentration you are applying for, where you heard about this opportunity, and how our mission speaks to you, to: Careers@GoTeamIMPACT.org. Team IMPACT is committed to cultivating an environment where diverse perspectives and backgrounds are embraced; we welcome and encourage applicants to bring their authentic selves, without concern of discrimination/harassment.